1 A None No Power Seat 1 A is a Business Class Bulkhead seat that has extra legroom. The proximity to the lavatory and galley may be bothersome. This is a bassinet location and passengers traveling with infants may be seated in this area. 1 C None No Power Seat 1 C is a Business Class Bulkhead seat that has extra legroom. The proximity to the lavatory and galley may be bothersome. This is a bassinet location and passengers traveling with infants may be seated in this area. 1 D None No Power Seat 1 D is a Business Class Bulkhead seat that may have slightly restricted legroom. 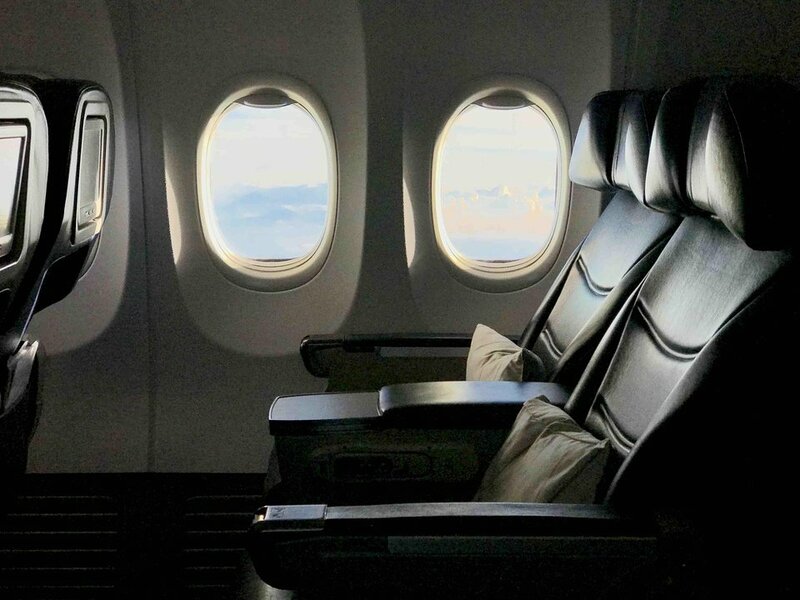 While some find these seats to be a little cramped because of the bulkhead, others enjoy that there is no one in front of you. The proximity to the lavatory and galley may be bothersome. This is a bassinet location and passengers traveling with infants may be seated in this area. 1 F None No Power Seat 1 F is a Business Class Bulkhead seat that may have slightly restricted legroom. While some find these seats to be a little cramped because of the bulkhead, others enjoy that there is no one in front of you. The proximity to the lavatory and galley may be bothersome. This is a bassinet location and passengers traveling with infants may be seated in this area. 11 A None No Power Seat 11 A is an Economy Class seat that may have limited recline due to the exit row behind. 11 B None No Power Seat 11 B is an Economy Class seat that may have limited recline due to the exit row behind. 11 C None No Power Seat 11 C is an Economy Class seat that may have limited recline due to the exit row behind. 11 D None No Power Seat 11 D is an Economy Class seat that may have limited recline due to the exit row behind. 11 E None No Power Seat 11 E is an Economy Class seat that may have limited recline due to the exit row behind. 11 F None No Power Seat 11 F is an Economy Class seat that may have limited recline due to the exit row behind. 12 A None No Power Seat 12 A is an Economy Class Exit Row seat that has extra legroom. However, this seat has limited recline due to the exit row behind. The tray table is in the armrest, making the armrest immovable and slightly reducing seat width. The seat in front does not recline, giving you more space. There is no floor storage during takeoff and landing. 12 B None No Power Seat 12 B is an Economy Class Exit Row seat that has extra legroom. However, this seat has limited recline due to the exit row behind. The tray table is in the armrest, making the armrest immovable and slightly reducing seat width. The seat in front does not recline, giving you more space. There is no floor storage during takeoff and landing. 12 C None No Power Seat 12 C is an Economy Class Exit Row seat that has extra legroom. However, this seat has limited recline due to the exit row behind. The tray table is in the armrest, making the armrest immovable and slightly reducing seat width. The seat in front does not recline, giving you more space. There is no floor storage during takeoff and landing. 12 D None No Power Seat 12 D is an Economy Class Exit Row seat that has extra legroom. However, this seat has limited recline due to the exit row behind. The tray table is in the armrest, making the armrest immovable and slightly reducing seat width. The seat in front does not recline, giving you more space. There is no floor storage during takeoff and landing. 12 E None No Power Seat 12 E is an Economy Class Exit Row seat that has extra legroom. However, this seat has limited recline due to the exit row behind. The tray table is in the armrest, making the armrest immovable and slightly reducing seat width. The seat in front does not recline, giving you more space. There is no floor storage during takeoff and landing. 12 F None No Power Seat 12 F is an Economy Class Exit Row seat that has extra legroom. However, this seat has limited recline due to the exit row behind. The tray table is in the armrest, making the armrest immovable and slightly reducing seat width. The seat in front does not recline, giving you more space. There is no floor storage during takeoff and landing. 14 A None No Power Seat 14 A is an Economy Class Exit Row seat that has extra legroom. The tray table is in the armrest, making the armrest immovable and slightly reducing seat width. There is no floor storage during takeoff and landing. This seat has no recline. 14 B None No Power Seat 14 B is an Economy Class Exit Row seat that has extra legroom. The tray table is in the armrest, making the armrest immovable and slightly reducing seat width. There is no floor storage during takeoff and landing. This seat has no recline. 14 C None No Power Seat 14 C is an Economy Class Exit Row seat that has extra legroom. The tray table is in the armrest, making the armrest immovable and slightly reducing seat width. There is no floor storage during takeoff and landing. This seat has no recline. 14 D None No Power Seat 14 D is an Economy Class Exit Row seat that has extra legroom. The tray table is in the armrest, making the armrest immovable and slightly reducing seat width. There is no floor storage during takeoff and landing. This seat has no recline. 14 E None No Power Seat 14 E is an Economy Class Exit Row seat that has extra legroom. The tray table is in the armrest, making the armrest immovable and slightly reducing seat width. There is no floor storage during takeoff and landing. This seat has no recline. 14 F None No Power Seat 14 F is an Economy Class Exit Row seat that has extra legroom. The tray table is in the armrest, making the armrest immovable and slightly reducing seat width. There is no floor storage during takeoff and landing. This seat has no recline. 29 C None No Power Seat 29 C is a standard Economy Class seat. However, the proximity to the lavatory may be bothersome since passengers often congregate in this area during flight. 29 D None No Power Seat 29 D is a standard Economy Class seat. However, the proximity to the lavatory may be bothersome since passengers often congregate in this area during flight. 30 A None No Power Seat 30 A is an Economy Class seat located in the last row of the plane and may have limited recline. The proximity to the lavatory and galley may be bothersome. You will also be among the last passengers to deplane upon arrival. 30 B None No Power Seat 30 B is an Economy Class seat located in the last row of the plane and may have limited recline. The proximity to the lavatory and galley may be bothersome. You will also be among the last passengers to deplane upon arrival. 30 C None No Power Seat 30 C is an Economy Class seat located in the last row of the plane and may have limited recline. The proximity to the lavatory and galley may be bothersome. You will also be among the last passengers to deplane upon arrival. 30 D None No Power Seat 30 D is an Economy Class seat located in the last row of the plane and may have limited recline. The proximity to the lavatory and galley may be bothersome. You will also be among the last passengers to deplane upon arrival. 30 E None No Power Seat 30 E is an Economy Class seat located in the last row of the plane and may have limited recline. The proximity to the lavatory and galley may be bothersome. You will also be among the last passengers to deplane upon arrival. 30 F None No Power Seat 30 F is an Economy Class seat located in the last row of the plane and may have limited recline. The proximity to the lavatory and galley may be bothersome. You will also be among the last passengers to deplane upon arrival. 5 A None No Power Seat 5 A is an Economy Class Bulkhead seat that has extra legroom. The tray table is in the armrest, making the armrests immovable and slightly reducing seat width. There is no floor storage for this seat during takeoff and landing. 5 B None No Power Seat 5 B is an Economy Class Bulkhead seat that has extra legroom. The tray table is in the armrest, making the armrests immovable and slightly reducing seat width. There is no floor storage for this seat during takeoff and landing. 5 C None No Power Seat 5 C is an Economy Class Bulkhead seat that has extra legroom. The tray table is in the armrest, making the armrests immovable and slightly reducing seat width. There is no floor storage for this seat during takeoff and landing. 5 D None No Power Seat 5 D is an Economy Class Bulkhead seat that has extra legroom. The tray table is in the armrest, making the armrests immovable and slightly reducing seat width. There is no floor storage for this seat during takeoff and landing. 5 E None No Power Seat 5 E is an Economy Class Bulkhead seat that has extra legroom. The tray table is in the armrest, making the armrests immovable and slightly reducing seat width. There is no floor storage for this seat during takeoff and landing. 5 F None No Power Seat 5 F is an Economy Class Bulkhead seat that has extra legroom. The tray table is in the armrest, making the armrests immovable and slightly reducing seat width. There is no floor storage for this seat during takeoff and landing. 8 A None No Power Seat 8 A is a standard Economy Class seat that is missing a window. 8 F None No Power Seat 8 F is a standard Economy Class seat that is missing a window. 9 A None No Power Seat 9 A is a standard Economy Class seat that is missing a window. 9 F None No Power Seat 9 F is a standard Economy Class seat that is missing a window. Almost all 737-800s have personal AVOD screens featuring a wide variety of music and audio options. All other 737-800s have standard audio options. Almost all 737-800s have personal AVOD screens for all seats. Business Class has 10.6" screens while Economy Class has 9" screens. All other 737-800s have overhead screens. There is a 110v AC power outlet at every seat. 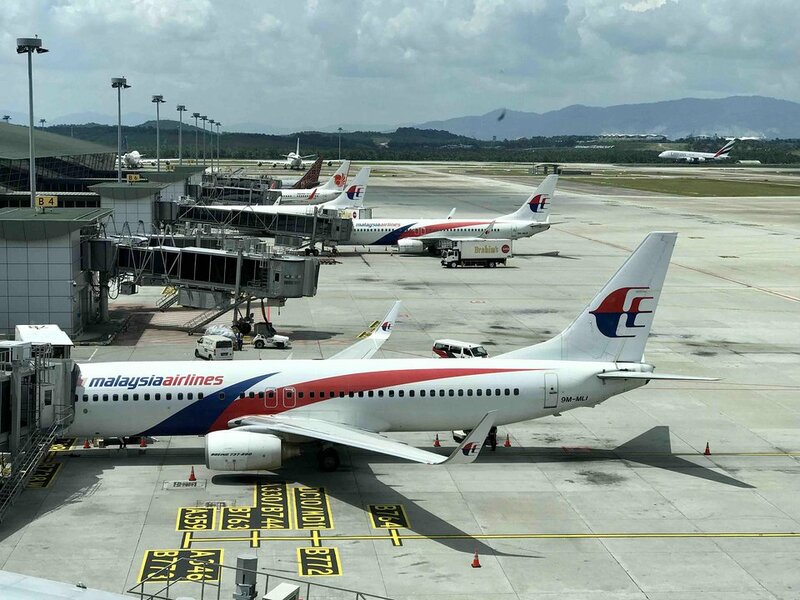 Malaysia Airlines operates two versions of the Boeing 737-800: one version with 150 Economy Class seats and a second version with 144 Economy Class seats. This version operates on short-haul flights with 16 seats of Business Class and 150 seats of Economy Class. Business Class: Meal tray table conveniently stowed in the armrest. Cocktail tables are available at the center armrest. Individual overhead reading lights. Seat cover: Woolen. Headrest cover: Linen. Seats are arranged in pairs (2-2). Economy Class: Seatback meal tray tables are available except in the front row which is an 'in-arm' table. Individual overhead reading lights. Seat cover: Woolen. Headrest cover: Paper disposable. Seats are arranged as 3-3. Passengers can choose their preferred seat when booking their flight or when checking in online. Also, passengers can change their seat selection or other flight details via Manage My Booking. To read more about how to get your favorite spot click here. ROW 4 has limited recline due to the bulkhead wall behind. Row 4 seats can NOT be declined; the seats infront of the bulkhead should not be colour "green". This 737 platform should be relegated to shorter sectors as it only fit for domestic ops utilisation. Using this plane on journey between KL and Perth. Worst business class seat ever. No footrest and hardly any recline at all. No TV screen. Plane is old and worn. 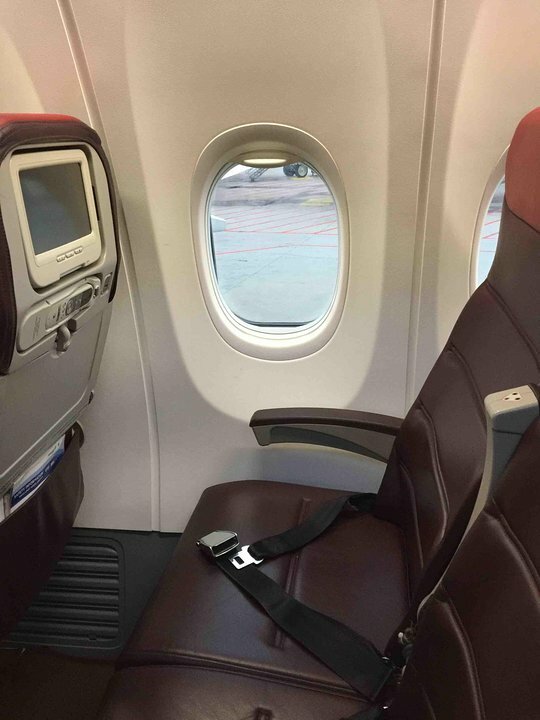 Would not have been so bad if it had been a daytime flight but it is late evening going out to Perth and the return flight leaves at 2am - 6 hours overnight in these seats when you have paid for business class is unacceptable. The entire row 4 (Business Class) does not recline fully, compared to Row 1-3. This is because of the partition behind, which blocks it. Horrible 5.5 hours flying KUL to PER on MH127. No in-flight entertainment (NO AVOD), seats was cramped and plane is old. 2 male cabin crews have to serve the whole economy class so basically service is non existence. 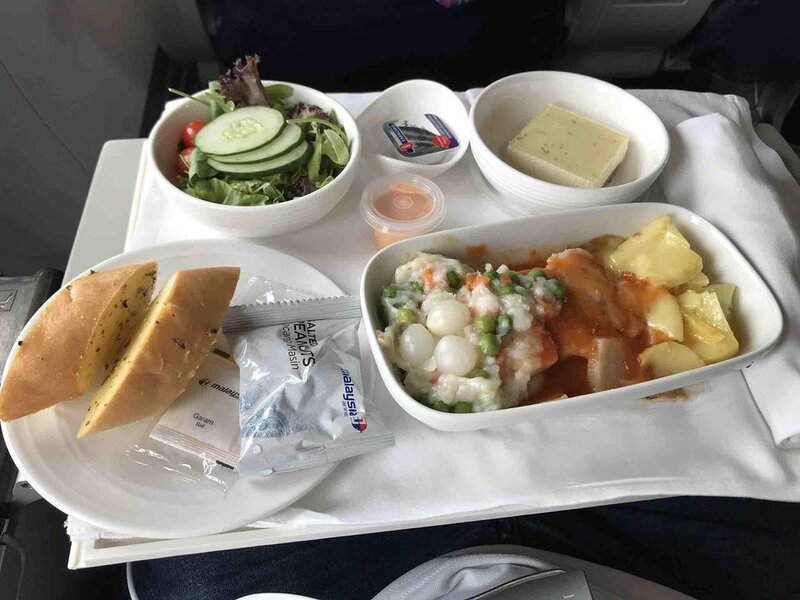 In plane meal is horrible, no offerings of drinks and snacks before nor after serving meals. No empathy from cabin crews when seeing I carry my baby son up and down the aisle trying to comfort him instead i get the disgusted look from the cabin crew. It's totally a budget flying experience but we are paying full commercial airline price. Was seated at 24D frm KLIA to Taipei. Seat was extremely narrow. After lunch, the queue to the toilet at the back was horrendous. Pity those ppl seated at Rows 25-30 as if they were the gatekeepers to the toilet. If you are seated in the front, good luck waiting for the toilets at the back. I would suggest removing this plane from medium long haul flights as 2 toilets to serve the economy class is not enough. The Most Uncomfortable and conjusted Business Class Seats ever- Actually these seem to be Premium Economy Seats. This was a very Old and Small Aircraft, Total Rip Off. Also it is very common for Malaysian Airlines to be delayed ! 3rd Class Airlines! This was a 2+ hour Kuala Lumpur to Denpasar. It was regular 737 Business Class seat -- just okay. Just normal, slightly reclining seats, somewhat wider and better pitch than Economy. My husband had the seat next to me -- 3A. We found the service only fair -- very brusque, unfriendly older gentleman and a sweet young lady. They both seemed inexperienced and just sort of threw food and drinks at you without speaking. I did not find anything about the cabin or the service to be Business Class. Extra legroom but if you're big in size, this would not be ideal as the tray comes out from the arm rest and may not lay flat to hold food tray. Also, need to watch for bulk head. Service was good. Great for short haul trip, service was impeccable! Legroom was fantastic as it was the 1st seat but mind the head due to bulk head above. Aisle seat was okay. Seat does recline so can get decent rest. Seat 3A is the best in business class because you get three windows. 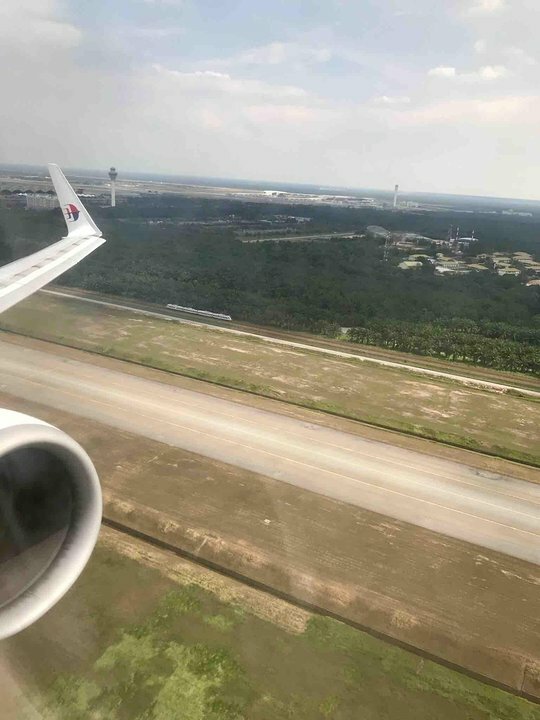 Also it is far enough from the noises from economy section.On my way to BWN (MH730) i was seated in 4A and had terrible time from kids screaming from the economy section. Service was great, especially when your wife and you are the only pax in the business class. Great seat for a short regional hop. Service brilliant, and really personalised with such a small cabin. Only disadvantage is that when the person in front reclines all the way, it can be a bit hard to see the tv screen if you are tall, like I am. Not much disturbance from coach. Bathroom kept clean. The seats in business class were great for a short BKK-KUL flight. I sat on the 777 seats before but i think those were a lot better. Thy only have one toilet for business class and sometimes the economy class passengers slip through. Seat was very spacious and could have a movie or two instead of just music and tv shows. Malaysia Airlines flies 2 versions of Boeing 737-800 (738) V1.